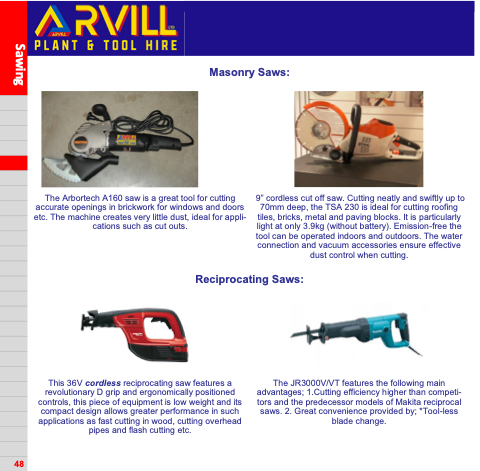 The Arbortech A160 saw is a great tool for cutting accurate openings in brickwork for windows and doors etc. The machine creates very little dust, ideal for appli- cations such as cut outs. 9” cordless cut off saw. Cutting neatly and swiftly up to 70mm deep, the TSA 230 is ideal for cutting roofing tiles, bricks, metal and paving blocks. It is particularly light at only 3.9kg (without battery). Emission-free the tool can be operated indoors and outdoors. The water connection and vacuum accessories ensure effective dust control when cutting. This 36V cordless reciprocating saw features a revolutionary D grip and ergonomically positioned controls, this piece of equipment is low weight and its compact design allows greater performance in such applications as fast cutting in wood, cutting overhead pipes and flash cutting etc. The JR3000V/VT features the following main advantages; 1.Cutting efficiency higher than competi- tors and the predecessor models of Makita reciprocal saws. 2. Great convenience provided by; *Tool-less blade change.